Is Rapid Trait Profiling the same as DISC or MBTI? Or like any of the hundreds of other psychometric or psychological profiling systems? Unlike all of those psychometric tests, Rapid Trait Profiling has no limitations to where it can be used. RTP doesn’t have the restrictions that every other system has. as other profiling tools are. None of these are a barrier to the success of Rapid Trait Profiling. You don’t need the person answer any questions and no one’s emotional state gets in the way of the results. The following is an example where an English speaking Australian business woman took on the task to help 2 young Hindi speaking Asian boys. She, from affluent Newcastle, Australia and the boys, from an impoverished village in India, she had no common language to communicate with them. So she asked me for advice. Other than a couple of photos of the boys, I have never seen them nor did I know anything about them. She sent me a couple of photos and from that I sent her a report on how they prefer to take in and process information. The following is her account of what followed. 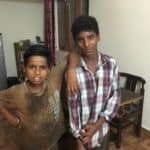 “I want to thank Alan for recently helping me with two young street kids I met in India in March this year. I contacted Alan after a chance meeting with two young boys requiring medical intervention. They began visiting my home daily for medical needs, meals and bathing. Once their health was improved, I was at a bit of a loss as to how to best help them further as we had a language barrier and cultural differences to contend with. Alan has proven that language, culture, and upbringing are no boundaries to his abilities. Despite not speaking the same language, Alan was able to give me thorough and accurate information regarding their natural abilities, their learning styles and their interests. The more time I spent with these boys, the more I could see these traits and others I had previously suspected were confirmed. Alan’s reading of their facial features opened up a world of opportunities for these boys. Knowing their strengths and learning styles helped me to position these two boys with mentors who now understand their needs. Knowledge is empowering and Alan’s help has given me the tools to help create a brighter future for these two young boys. What would it mean to you to be able to know exactly what other people like, how they think, how they like to receive information and how to communicate with them? How would you like to know how they are most likely to act in any given situation?